Wow. I’m still hung over from my late Thanksgiving feast two weeks ago. It was the first time that I’d really cooked a holiday meal for a group of people, so I was hell bent on making it amazing and over-the-top. It was. There were only four of us, and I made way too much food. Two of the dishes were repeats, but the others were brand new recipes that I’d been dying to try. In France, celery root is quite common, and is often served raw and grated in a light mayonnaise-based sauce. It has a deliciously sweetish flavor that is surprising, and not like anything I’d ever eaten before. A few weeks ago I brought some leftover boeuf bourguignon to work for lunch. I was eating and talking about food with my colleagues as usual, when one of them mentioned that her favorite side dish for the classic French stew was mashed celery root. This opened my eyes to a whole new realm of possibilities using cooked celery root. Since I’m a huge potato junkie, I knew I’d be making two potato dishes for the big feast. I stumbled across a recipe on Epicurious that combined my love for potatoes with my other favorite thing, broiled, bubbly, cheesy gratin, and I was sold. The celery brought a certain sweet sophistication to the dish, much like parsnips do, but was less pronounced, more subtle. The combination was fantastic, and paired with the rosemary, garlic, crème fraiche and thinly sliced comte cheese, it was all together sublime. Thinly slice your potatoes and celery root, then steam them for about 5 minutes, until just beginning to be tender. Heat your cream in a small saucepan with the rosemary, garlic and a pinch of salt and pepper. Simmer the cream for about 3-4 minutes, then let set. Remove the half-cooked vegetables and slightly pat dry. Start by layering potatoes and celery root in the bottom of a baking dish coated in butter. Add salt and pepper every other layer. Once all of the vegetables are in place, pour the cream mixture over the rest and put into an oven heated to 375 degrees. After about 20 minutes, or when the vegetables start to brown, add the comte or cheese of your choice and finish under the broiler until cheese is just bubbly. 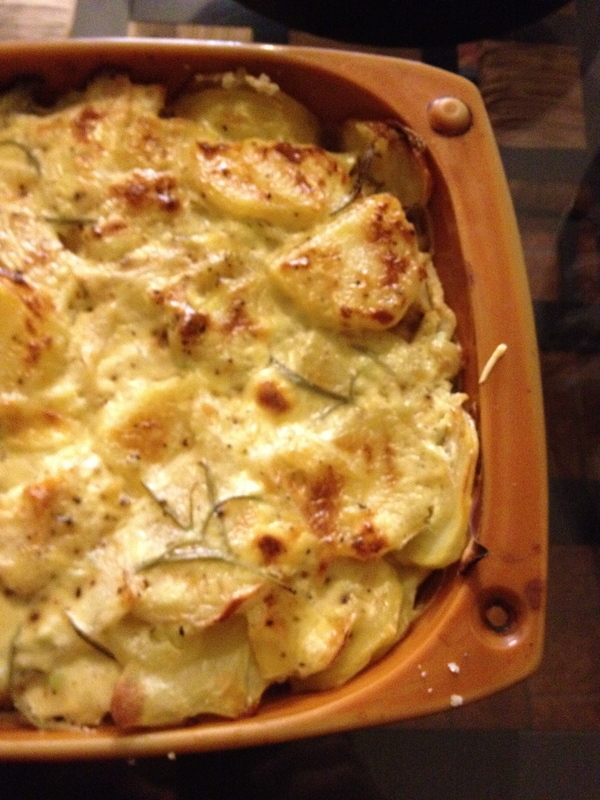 This entry was posted in General, Recipes and tagged celery root, comte, gratin, potato, rosemary by alamericaine. Bookmark the permalink. YUMMY!! Looks like a great comfort food. It is! You should try it!